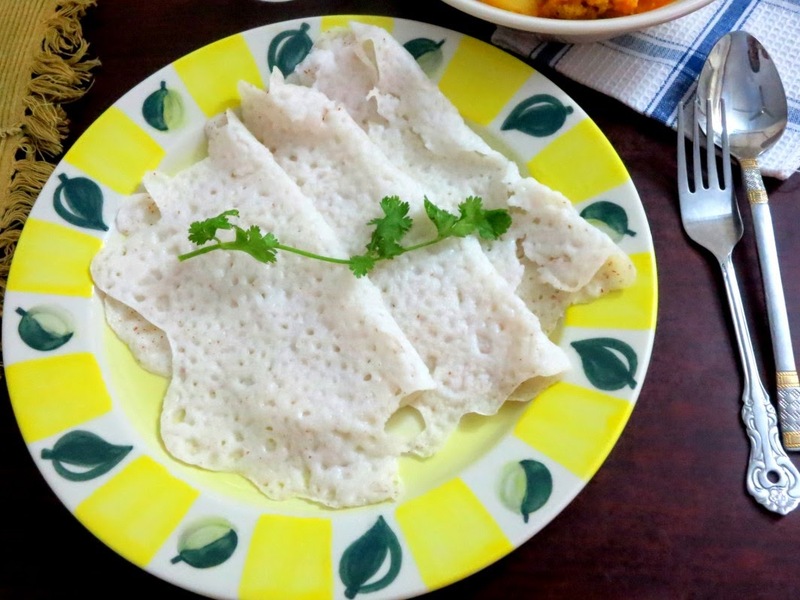 The pithas are famous here as well and I had shortlisted Poda Pitha, which is a special dish prepared during Raja, a 3-day celebration, that starts on the first day of Asara month. This welcomes the rains and marks the start of agriculture season. As with all festivals, this is usually enjoyed with lots of fanfare and food. The main one being the Poda Pitha, which means a baked cake. In days before oven was popular, they used to put the pithas in earthen vessel on top of the dying wooden embers in the night and the dish would be baked nicely by the next day morning. This poda pitha is usually served with chicken curry or mansa tarkari. The famous Rasagolla and Chenna Poda, was supposed to have originated from Odisha. 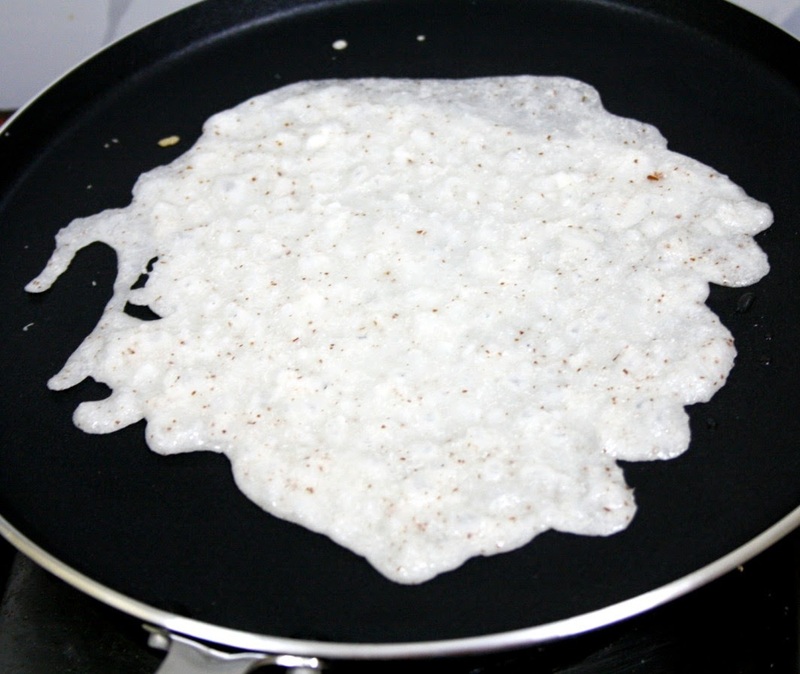 The dish that I finally ended up making was the Nadia Chitau Pitha or a pitha made with coconut. 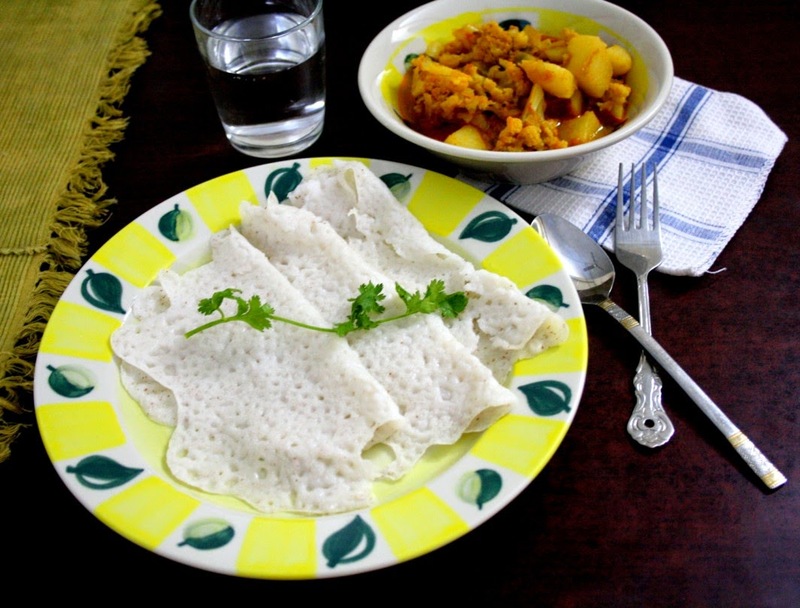 This is same as Neer dosa that we have in south and I didn't even check it until now. I see the proportion is same but now is too late! Soak the rice in water for 2 hrs. Grate the coconut and keep it aside. Add water to make a thin batter out of it. Heat oil in a tawa, pour some batter into it, and cover it. 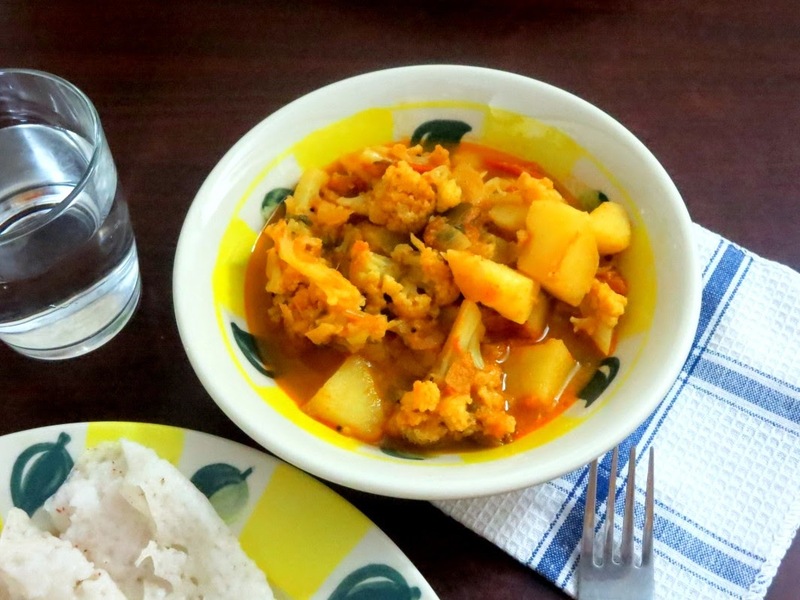 Serve hot with boiled milk, dalma or any spicy curry. 3/4 cup of rice gives about 1 & 1/2 cup rice after soaking. 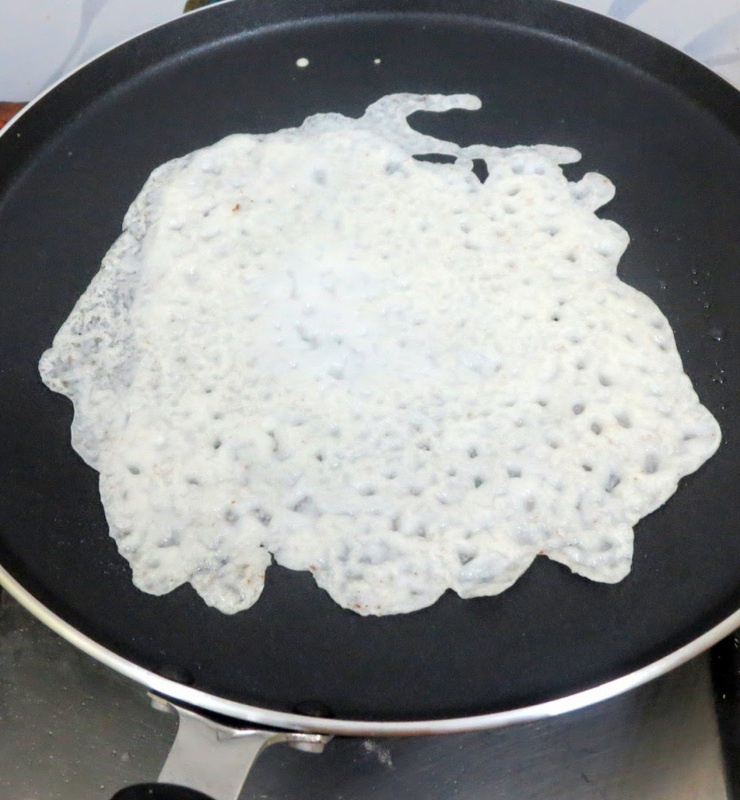 Make the batter thin, so that you can easily spread the batter by just swirling the tawa. The recipes mention that this should be covered with lid, and not flipped to the other side once done. 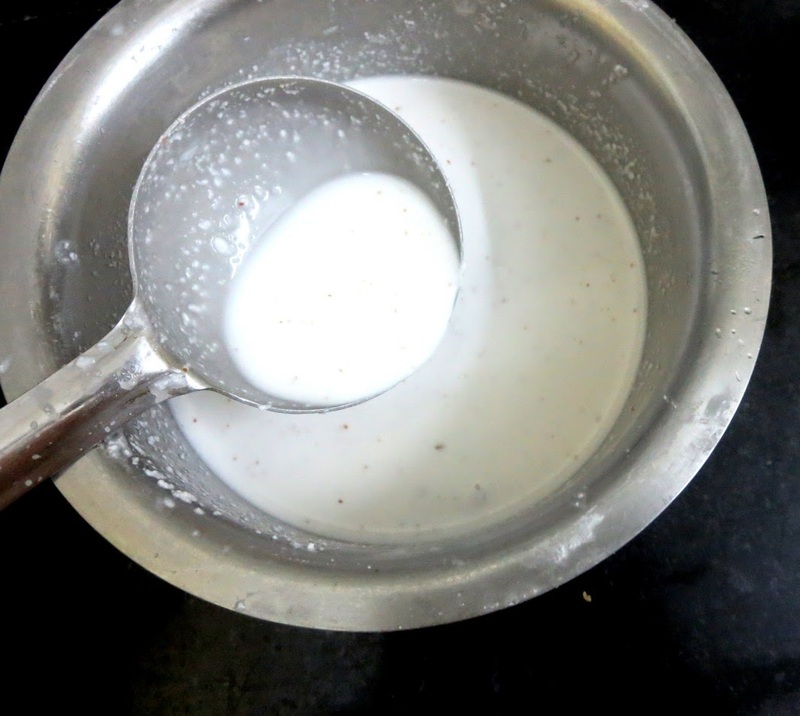 After grinding, the batter was refrigerated. So that it doesn't get fermented but is ready to be used. Wash and clean the cauliflower, Cut into florets. Blanch in hot water for 10 mins. Cube the potatoes and have the fresh peas ready. Heat a non stick pan with a tsp oil, saute the drained cauliflower, fry for 5 mins on high, remove and keep it aside. Heat the remaining oil, add the ground paste, cook for 5 - 7 mins till raw smell leaves Now add all the spice powders. Add the potatoes, peas, and simmer for 10 mins. Now add the tomatoes and mix well. Next add the fried cauliflower florets and continue stirring till it gets properly mixed with the paste. Then add 1 cup of water, salt to taste, stir well and cover it with a lid. 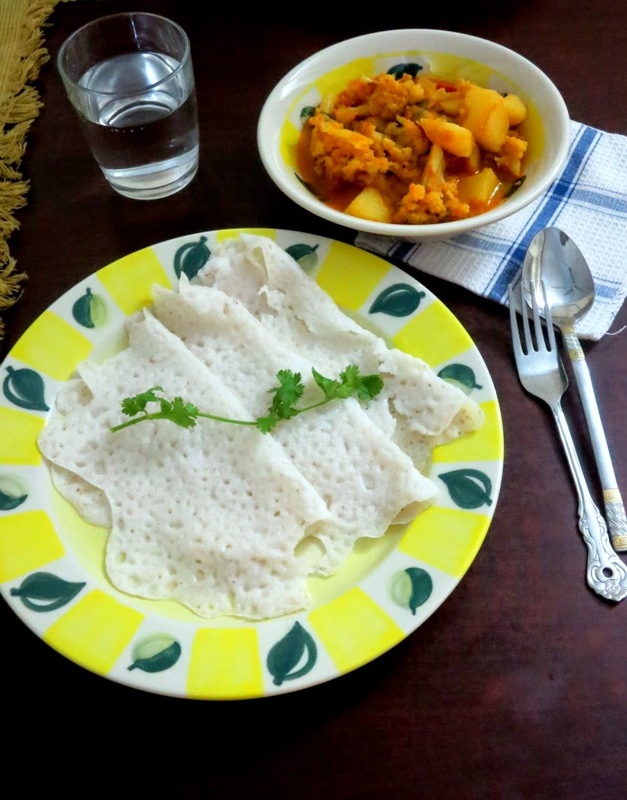 Enjoy the Phula Kobi Tarakaree with Nadia Chitau Pitha.